The Canna Agency is a boutique cannabis consulting agency specializing in cultivation facility design, construction & project management, cultivation operations and efficiency evaluation. We also excel in competitive state application preparation, RFP response packaging, due diligence evaluations, political assessment and land use matters. The Canna Agency is built on empirical experience, integrity, transparency and our Founder's 25 years of cannabis specific experience. We are rooted in Northern California. Our Founder cut his teeth in Humboldt County. We service clients across the United States and are embarking upon the global cannabis marketplace, as well. In addition to our primary scope of practice, we are currently developing proprietary industry specific software, hardware, technology based cultivation solutions and scientific hardware advancements. We are a privately held company. We are not controlled by investors, bankers or industry new comers whom are often only focused on profits at the expense of their customers and clients. Our verifiable experience, reputation, methods, practices, standards and results are what drive us and provide us with the foresight that keeps us at the cutting edge. We strive to remain current and relevant. We welcome you to experience the difference in working with true cannabis experts, passionate and consummate professionals. We invite you to work with "the CANNA agency". The Canna Agency (TCA) intends to build the world's first empirical data base providing functional cross comparison evaluations to various agricultural programs, equipment manufacturer's and nutrient products in order to provide the expanding hemp/cannabis market with rational efficacy ratings. We believe as businesses ramp up to to meet increasing demand in the market they will need unbiased efficacy ratings on equipment, lighting, nutrients and resource conscious cultivation techniques in order to navigate their expansion with confidence. TCA is contracted by multiple equipment and lighting companies, nutrient companies and product manufacturers; to run continuous real world comparison testing on their products. TCA embraces the opportunity to evolve its operations into a world class cannabis R&D Facility. The facility will double as TCA's corporate headquarters so that existing and potential clients may experience state of the art cultivation, industrial processing and laboratory experimentation first hand. The R&D chambers are completely bio secure and the environment completely controlled. This allows for true comparisons with multiple variable inputs. To date, TCA or its' clients are not aware of any similar facilities within the State of California. TCA firmly believes that this portion of its business will see exponential growth as more and more traditional agricultural firms seek entrance into the industry. TCA's cultivation/testing facility, once fully operational, will generate six harvests per year, utilizing individual plant production units to autonomously collect controlled data. TCA's historical margins, based on experience and proprietary techniques average near 70% . TCA's extraction laboratory will comprise of experimental extraction processes which concentrate and refine cannabinoids from whole plant biomass for use in research & development of product formulations to be used in strategy consultations with TCA clients. TCA's margins, based on discounted industry norms, average near 87% . I’ve been a pawn and a king, but this plant changed the whole game for me, it saved me from a lifetime of pain and ailment. The money would be nice... But, I want to propagate this plant in its finest forms ad infinum. 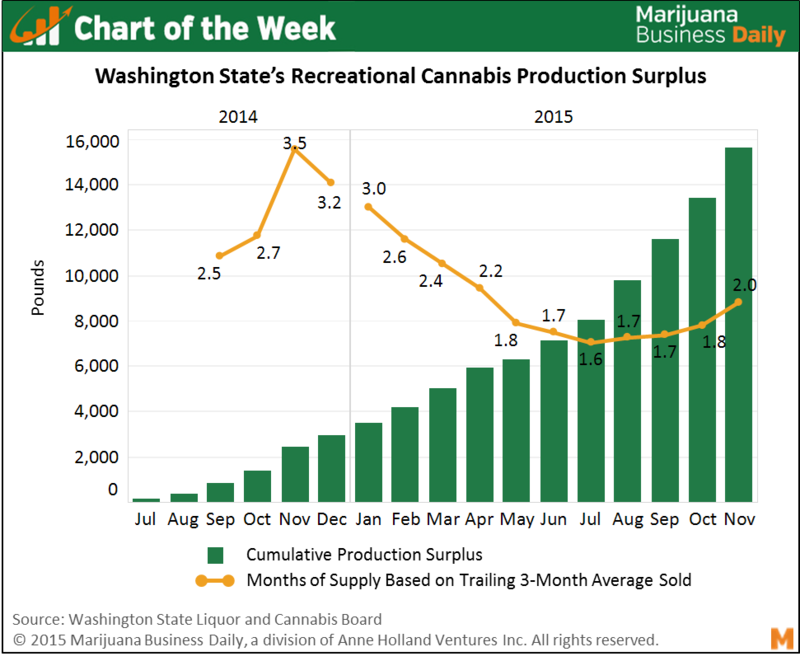 "A big shakeout is materializing in Washington State’s recreational cannabis industry as businesses struggle to determine the ideal balance between supply and demand..."
"Scores of cultivation companies have gone out of business in large part because of the oversupply issue, said Christopher Macaluso, a longtime cultivator in California who co-founded Canna Group, which provides consulting to cultivators in Northwest states. Producers are now sitting on a substantial amount of surplus inventory, and the future of many of them is in jeopardy. Some could try to unload low-quality inventory at fire-sale prices, flooding the market and exerting artificial downward pressure on the broader wholesale price." “The decreased yield is tough to justify,” which often is the case when growers switch to LED lights, he said. Macaluso is re-writing software that he is developing to include the “exponential waterfall effects of incorporating sustainable and conservation approaches,” such as using the latest breed of LED lights. Some manufacturers are on the cusp of launching more technologically advanced LEDs and other products that will give growers more bang for the buck. We promise to respond to your communication within 24 hours of receipt. All photos taken in our clients facilities and our personal research & development facility. We are humbled and appreciative of our clients continued support. Thank you.